There’s a growing number of windmills sprouting around the country. One can see fields of them from plane windows at 30,000 feet. There’s even a giant one on the east side of Cleveland that’s visible, on a clear day, across Lake Erie from the shores of Bay Village, Ohio, a small municipality on the west side of the city, where this author now resides. The windmills are harnessing the power of the wind to create clean energy, which can be delivered anywhere, I presume, including the car-charging stations I’ve noticed pop up in places like the nearby Whole Foods parking lot. Despite very conspicuous advances and installations, we’re apparently decades away — perhaps not until the 2040s — from reaching Peak Oil, according to Reuters. Clean and renewable energy is taking some time to gain market share. Some innovations take time to grab hold, others advance quickly. It can be difficult to project when a trend will reach its high-water mark. But we might have seen a prominent 21st trend and strategy reach that point in major-league baseball. In 2016, after a dramatic rise this decade, baseball might have reached Peak Shift. This year, shifts declined for the first time since their rapid rise earlier in the decade. Ten years ago, shifts were being used against left-handed power hitters exclusively. There wasn’t a shift employed against a right-handed hitter, according to the Baseball Info Solutions database, until June 11, 2009, when the Phillies moved three infielders to the left side of second base against Gary Sheffield. At that point, in the late 2000s, the Rays and Brewers were at the vanguard of wholesale shifting. In 2012, league-wide shift usage doubled, though it was still modest in terms of raw numbers. Gradually more teams bought in — teams like the Pirates, who increased their shift usage by 400% from 2012 to 2013. 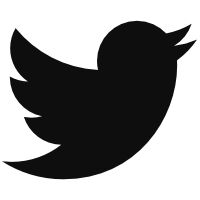 In 2014, usage doubled again, as the 10,000-shift mark was breached for the first time. The practice has since proliferated across the sport. 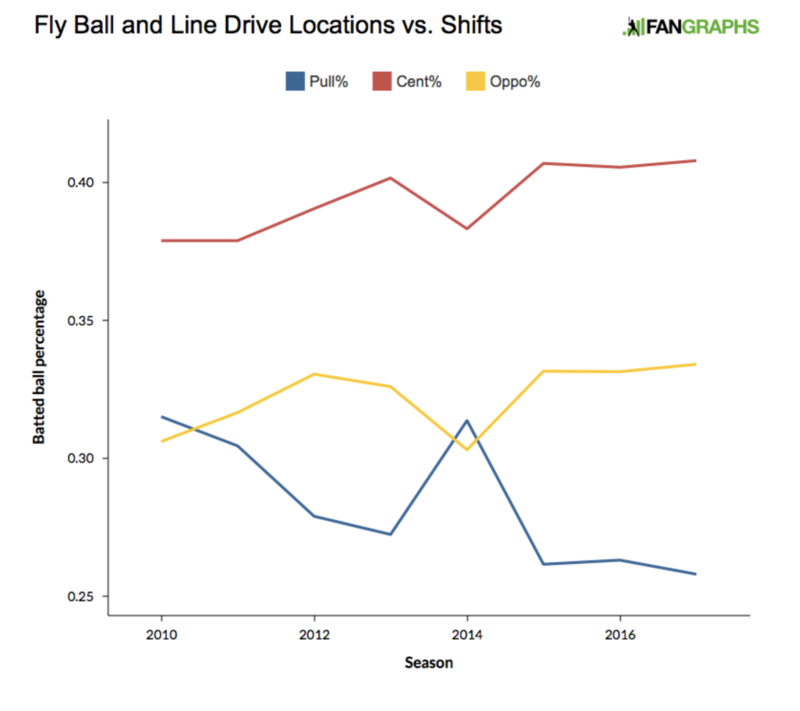 From 2012 to -16, shift usage grew by at least 34.8% each season. Shifting was still quite popular, it was still a standard practice in 2017, but what we saw was a slight contraction, a hint that some teams are beginning to lessen their dependence on the foreign alignments. What’s happened is that the value of the shifts has possibly decreased, a point explored recently for Baseball Prospectus by the excellent Russell Carleton. Let’s begin with the ground ball, which the shift is designed to suffocate. The distribution of ground balls hasn’t changed. For most batters, it’s difficult to hit a ground ball to the opposite field. Consider the distribution of grounders in 2007: 53.2% pulled, 33.6% center, 13.3% opposite. And in 2017: 53.7% pulled, 33.6% center, 12.7% opposite. As you might expect, however, the total number of ground balls to the opposite field that have become base hits has increased as shifts have increased. Compared to 2011, MLB hitters have produced about 500 more base hits on ground balls to the opposite field. Hitters’ average on pull-side grounders has declined from .202 in 2010 to .190 last season and .186 in 2016. While the volume of hits has increased — perhaps irking pitchers and coaches — the overall rate of success is relatively steady. Batters are not able to guide ground balls, generally, through vacated portions of the infield any better than they were in 2011. The shift decline appears somewhat contradictory. If the shift seems to be roughly as effective as in the past, why would teams employ them less often? To better understand that, it’s necessary to return to the beginning, to the man who helped usher in the era of shifts in Tampa Bay: Joe Maddon. It is Maddon, now in Chicago, who is in part responsible for the shift’s decline in 2017. What was interesting about 2016 is that, in the peak year of shifting to date, the top defensive team was the Cubs. They produced a historic defensive campaign and converted a remarkable percentage of batted balls (74.5%) into outs. It was the best rate since 1950, as Sam Miller noted in an ESPN piece last year, and it was during that season when the Cubs shifted an MLB-low 399 times. In 2017? The Cubs were again the least-shifting club in the majors, with just 302 of them. This is remarkable in context. It was Maddon, for example, who had his defenders account for 10% of all shifts in 2010. Now Maddon has his defenders playing straight up — or, at least not in a way that one would classify as a shift. While the Cubs aligned their defenders in more subtle ways, while Maddon said he was mostly concerned with defending the low line drive, Chicago is essentially playing straight up with some premium defenders. Perhaps some of the answers reside there, but we have to look up for answers. The overall distribution of fly balls and line drives hasn’t changed. 2017 line drives and fly balls: 29.1% pulled, 36.1% center, 34.8% opposite. But against shifts? Batters are evolving to pull fewer balls that are put in the air. While it’s tough to hit a ground ball to the opposite field, it’s easier to drive one there in the air. In 2010: 31.5% pulled, 37.9% center, 30.6% opposite. In 2017: 25.8% pulled, 40.8% center, 33.4% opposite. Hitters operate a little differently in the air versus shifts, more often getting balls in the air when the defense is realigned. It’s one motivation behind the Air-Ball Revolution. Consider that, in 2011, hitters posted a 1.9 GB/FB ratio against shifts. This past season? A 1.3 mark. Overall, ground-ball percentage has remained steadier. John Dewan estimated in the 2016 that the upper limit of shifts could reach 40,000 per season. Maybe the sport will not approach that ceiling. To understand why we might have seen Peak Shift, and why teams are perhaps seeing diminishing returns from the practice, we must not look to the ground, but rather, the sky. We hoped you liked reading We’ve Reached Peak Shift by Travis Sawchik! Who’s Your Pick for 2018? I’m not sure the argumentation is valid. If a ball is elevated over the shift the shift neither hurts, nor helps, those are hits regardless (if not caught by the outfield). 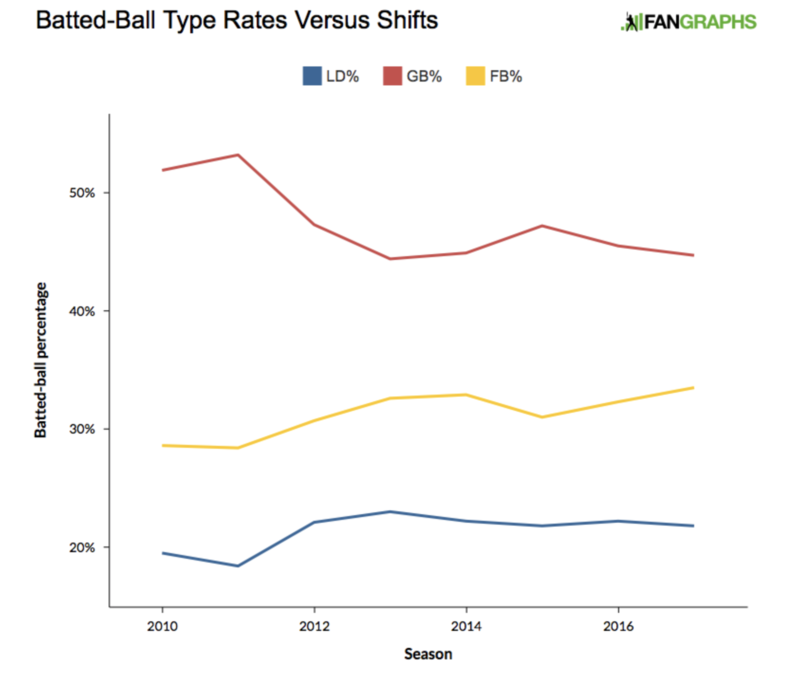 More elevated balls might reduce the absolute number of outs by the shift but on the balls not elevated the shift is still effective. Bautista was a flyball machine but he was still shifted because IF he hit one on the ground it was pulled (his fbs were pulled too). The shift never was worried about GB quantity, just with were you hit them if they hit them. I mean even if you are able to elevate the other way the conservative alignment wouldn’t help the defense either. So if a power hitter looks middle away in order to avoid rolling over might hit a couple more flyballs but less bombs and that is a win for the defense too. That is the tough thing about elevating well, pulled fbs are more effective but usually pulling means more rolled over grounders. Elevating the other way is easier but also less productive. That is also why bautista was so good he was able to selectively pull in the air. Now of course there are a few hitters with true oppo power but while the new ball migh help with that those are still rare, not a lot of peak ryan howards out there (and even howard as a great oppo flyball hitter was a victim of the shift). most damage on fly balls is done pull to pull center gap and if hitters try to avoid that I think that is good for defenses. Opposite field air balls last season: .297 avg/.502 SLG/ 102 wRC+ …. All grounders: .241 avg./.262 SLG/ 29 wRC+. Do you also have pulled flyball wRC+. Sure oppo fly balls are better than grounders but I’m sure pulled FBs are a lot better. Sure oppo fbs are better than grounders (but way worse than pulled fly balls) but still the baseline for the shift is the standard alignment. Of course the shift becomes less effective with more FBs but so does any other if alignment. If anything lifting oppo fly balls is more effective vs straight up alignment because oppo grounders are more likely to go through the shift than standard alignment. So if the shift incentivizes players to lift oppo balls they should even moreso do that against standard alignment because oppo grounders do worse against it. If a defense wanted to adjust to this they would need to move an infielder out of the infield completely. I don’t think it’s good to include line drives in the same category as fly balls for this analysis. Line drives are very consistently good for the batter regardless of whether they’re hit to the pull side (363 wRC+) or the opposite side (305 wRC+) and regardless of whether the defense has shifted or not (347 wRC+ vs 321 wRC+). As Dominikk hypothesizes, opposite field fly balls are typically not good outcomes for the batter regardless of if there was a shift or not (-22 wRC+ for shift and -33wRC+ for no shift). These statistics indicate that teams shouldn’t shift less simply because some batters will attempt to elevate the ball more when shifted on. I think what is much more likely, is that the potential value of the shift has gone down with the flyball revolution. Not that it doesn’t work, but that it just doesn’t matter as much now. The reason I lumped line drives and fly balls together is because they are distributed more evenly as air balls, whereas most ground balls are pulled. That’s just the nature of the ball on the ground vs. the ball in the air. LIne drives are generally the good air-ball outcome, fly balls less so. Hitters can use the whole field when launching balls in the air, much more difficult to do with ground ball.